Amid the deluge of detritus on Facebook, an image of truth and beauty lit up my feed the other day. 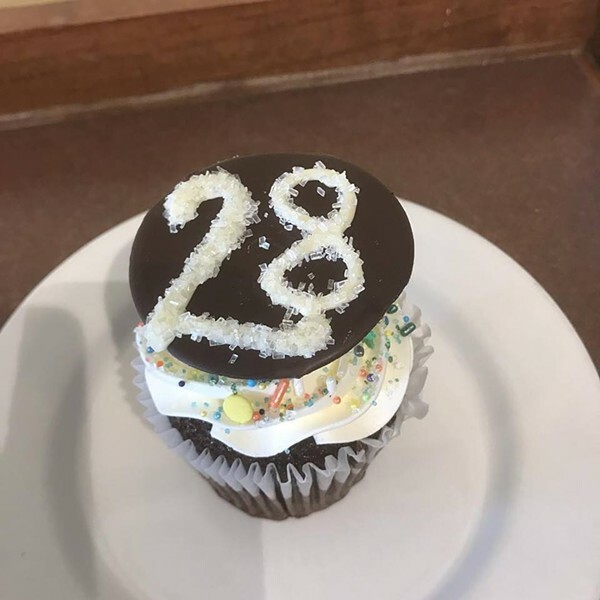 It was a chocolate cupcake topped with a mound of vanilla frosting and decorated with sparkly numerals: 28. “Happy Birthday to us!” the accompanying text read. Mirabelles Café & Bakery turned 28 this week. The occasion provided a good reason — though not a necessary one — for lunch at one of Burlington’s best restaurants. 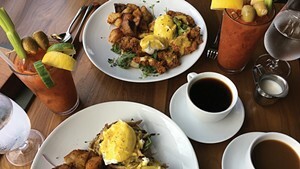 For almost three decades, chef-owners Alison Lane (the sweet stuff), Andrew Silva (the savory side) and their team have produced a beautiful, imaginative and consistently high-quality assortment of cakes, pies, pastries, muffins, cookies, éclairs, soups, sandwiches, salads, omelets, pancakes, panini and lunch specials. To get a sense of the range and delight, think crème brulée cake and ratatouille tartine. My family has made Mirabelles' chocolate cake with raspberry filling and mocha buttercream icing a birthday tradition for 20 years. This consumption is not even a pinch in the batter of the 300,000 or so cakes that Lane estimates her bakery has made. 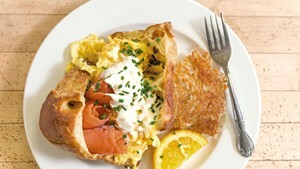 But it was lunch that propelled me to a seat at the window counter on the dreary last day of October. “November is the ugliest month,” the man next to me said. I knew I was going to enjoy the meal. We each ordered from the blackboard menu that lists soups and lunch specials. 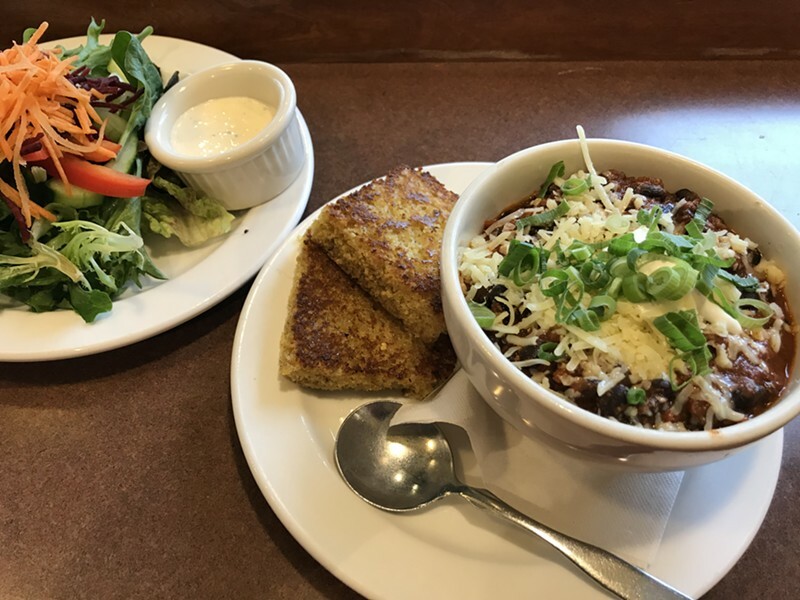 I got the chorizo and black bean chili served with two slices of grilled and buttered corn bread and a mixed green salad ($12). The hearty chili, topped with sour cream, chopped scallions and shredded cheddar, was custom-made for the cusp of the month. Each bite seemed to ward off the chill and dark of November, aka "stick season." My impromptu lunch mate, Burlington architect Brad Rabinowitz, chose the grilled steak sandwich with blue cheese dressing, lettuce and crispy onion rings on a toasted bun ($10.50). “You made the right choice,” he said when my meal arrived. “You did, too,” I replied. “Those onions are key,” I observed, eyeing the crispy rings that tumbled from his sandwich. Rabinowitz, I learned, has been a Mirabelles regular for more than two decades. His architecture firm is above the café and he heads downstairs for lunch about three days a week, he said. Two Rabinowitz family wedding cakes — his and his daughter's — were made at Mirabelles. Working upstairs, Rabinowitz said, means “there’s always tomorrow for me” at Mirabelles. The day after his steak sandwich, he had the chili.